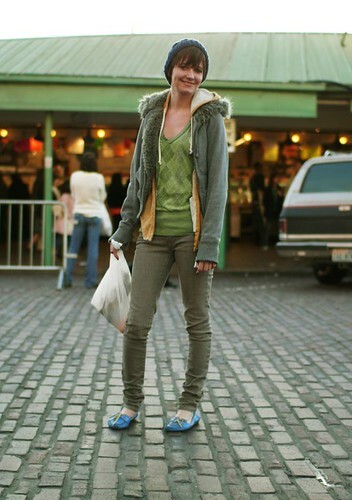 Jamie Pattan at Pike Place Market. The colors of her outfit are so pleasing together. Her shoes play together beautifully with her green argyle v-neck. I also love the setting -- the cobblestone road, the green structure, and the slight hint of backglow lighting are fabulous! The greens she's wearing are among my favorite colors - and I love the springtime jolt that the shoes provide. yay! jamie makes me coffee at café senso unico. she is adorable.